During Electrical Safety week, take the opportunity to check your home and consider the safety of your family. Grab some useful information about electrical safety and, read about a scary incident that could have resulted in someone losing their home through a faulty freezer in their garage. Electrician Andy Warren, from Yate, woke up to the sound of a car tyre exploding and realised his garage was on fire. He called 999 and Avon Fire & Rescue Service attended to deal with the fire, which started early in the morning. Once the flames were out he was able to assess the damage to his classic Morris Oxford car and other items in the garage. The fire started after a fault with a freezer in the garage. 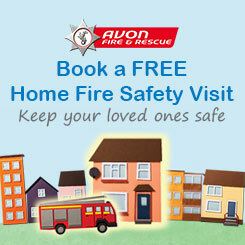 Since 2006 AF&RS has attended 370 accidental house fires where the cause has been a fault with an electrical appliance. In 120 cases tumble driers were involved, in 116 fires it was a washing machine at fault, 77 fires were caused by faulty dishwashers, 39 cases involved fridge/freezers and 18 fires were caused by problems with washer-driers. Overloading your sockets puts an unsafe load on your wiring that can result in overheating and fire. User this handy calculator to see if your sockets are safe. We think you will be surprised at how little it takes to overload the socket and create a potentially dangerous scenario. Install this app on your phone or tablet to help you carry out a quick and simple visual check of your home to assess your electrical safety. For piece of mind, use this website to find an electrician registered with one of the government-approved schemes. Click here to visit the Registered Competent Person website. Use this list to see if you have any appliances that have been recalled because of a safety. Use the search box to look for something specific.